Blainville's beaked whale (Mesoplodon densirostris), our other study species, is a member of an especially poorly understood and fascinating group of animals, the Ziphiidae or beaked whales. I used to tell my university students "If you're looking for a sense of mystery in life, study beaked whales. Because the Ziphiidae is hands-down the most poorly understood family of mammals on the planet." (I had no idea at the time that one day I'd be studying them myself!) At the time I was teaching, the Ziphiidae section in the textbook was full of phrases like "No data." "Data deficient." "Has never been seen alive." "Range unknown." "Social structure unknown." "Diet unknown." "More research needed." We know a bit more about beaked whales today, but still not much. Beaked whales are a group of about 21 species of mid-sized toothed whales, most of which are still, to this day, very poorly known. Their name comes from the pointy "beak" shape of the front of their heads, rather like a dolphin's beak. A real oddity of beaked whales is that males of most species (but not the females) have a pair of unusually shaped teeth that stick out of their lower jaws. It's thought that they use these tusks for fighting other males, because only males have the teeth, and adult males are often criss-crossed with scrape marks that they've presumably acquired while fighting other males. The species that we're studying, the Blainville's beaked whale, has a peculiarly shaped lower jaw that seems to have evolved to support these short teeth. The "cheeks" of the lower jaw extend high above the face on both sides, and each side of the lower jaw is topped by a short, stout tooth (see photos). 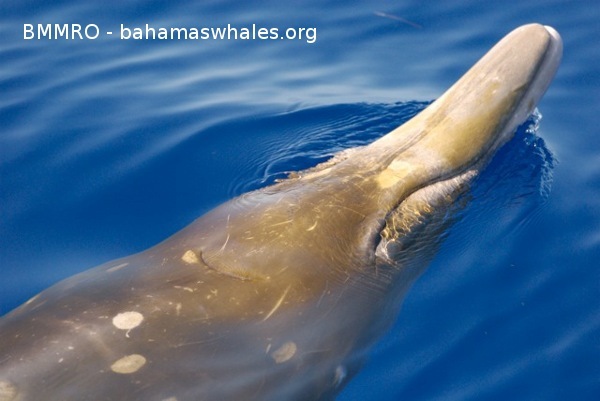 All the beaked whales are deep divers that tend to be rather shy, diving when a ship comes near them and then staying underwater for a long time.... during which the ship at the surface usually loses track of them. That makes them pretty difficult to study! Fortunately, our colleagues at the BMMRO have developed the snorkeler-towing method (see our first post), allowing them to follow a group of Blainville's for short periods of time. Their research shows that the Blainville's are usually in small groups of 3 to 7 animals. Each group usually has one adult male accompanied by a few females and younger animals. They tend to do a long, deep dive of almost an hour, then a series of shorter, shallower dives while they're getting ready for the next long deep dive. It's during the shorter, shallower dives that we can follow them. Furthermore, the BMMRO researchers can individually identify the different Blainville's whales by means of the scrape marks on the males, and scars from cookie-cutter sharks. And they've realized they see the same individual whales again and again. In other words, the whales are local residents, staying within a relatively small area. 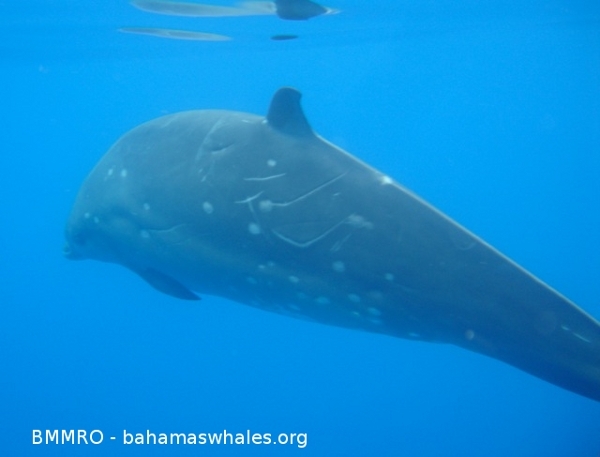 "We're actually on our third generation of beaked whales," says Charlotte (of our BMMRO), meaning that they've followed some individual beaked whales so long that they've seen whales raise offspring to adulthood, and then seen those offspring have grand-offspring of their own. Year by year, thanks in large part to researchers at the BMMRO, our picture of beaked whales is getting clearer. But there's still a lot of mystery remaining, and a lot more to learn. Thanks for sharing! I didn't know about their unusual teeth. 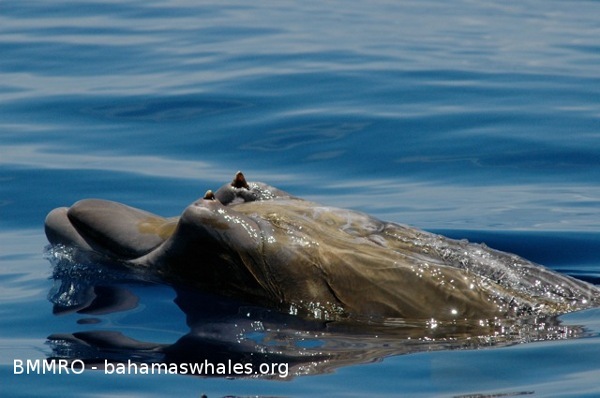 Bahamas Expedition: A Long Day!